Hope everyone had a Happy Valentines Day and was able to stay warm through the cold days! It's supposed to warm up a bit this week! Sounds like we might get a little snow this week! Please be careful and safe! Our special for this week is on Quilt in a Day products. Buy any one item, Book, ruler, pattern, and get a second at 50% off (lower priced item will be 50% off). Great chance to get a book and ruler or a ruler and a pattern that you have been thinking about and save a bit. For your calendar planning, Pat Knoechel (sister to Eleanor Burns) will be here again in May with her trunk show and lecture to introduce us to the newest from Quilt in a Day. We will be publishing more details as soon as we have all in place! For those who have been interested in the Fold 'n Stitch Wreath, the first class on February 10 was a great success and most of the attendees got a major portion of their wreath done during class. The second class is on Sunday, February 21 at 1 pm. There are still a few seats available if you would like to join us! We have added a 2 day retreat with Carol Bunnell to the schedule on Friday, March 26 and Saturday, March 27 from 10 am to 10 pm daily. Call the shop for details! Our class listings have been updated... take a look through and see what might interest you. If nothing does, drop by and make a suggestion. We have several teachers ready to teach almost anything, always looking for a good suggestion. Remember to check the web site for future classes! Call the shop at (607) 748-0682 or stop in at the shop to sign up for classes! Reminder, as the weather threatens, call the shop before venturing out to ensure we are open. If the local schools are closed, we will probably be closed as well; although if the weather does not remain bad, we may be open later in the day. Safest just to call ahead. We will send a notice when we close early or close for the day (as long as we have power and internet, of course)! Happy Quilting! Stay safe and warm! 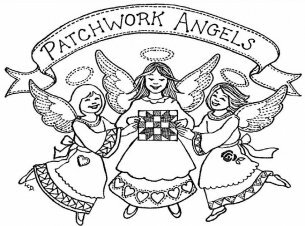 Rose and the gals at Patchwork Angels Quilt Shop.